Quasimodo returns in The Hunchback of Notre Dame II. He finds himself in even more trouble as an evil magician from a traveling circus attempts to steal the bell from his bell tower. 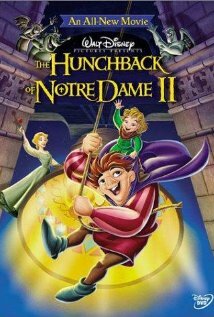 A young woman that Quasimodo falls in love with aids the mage in his attempt. What will happen to the bell? Can the main character save the bell? You will have to find a copy of this wonderful movie to find out for yourself. Keep in mind that this film has oodles of action, mystery, romance, and more to offer you. Fans of Disney may want to watch the two films together. To learn more, go to http://www.imdb.com/title/tt0257778/?ref_=sr_2. This movie gets a five out of five popcorns rating.